Natural splendor is great and all, but in New Orleans we tend to get our kicks from cultural expressions more than scenic vistas. Of course, we have scads of the former and hardly any of the latter in our flat, densely-built urban environs here. But every now and then the two combine and a prime example is coming up this weekend, May 17-19, at the Mid-City Bayou Boogaloo. Now in its eighth year, the Bayou Boogaloo keeps growing. An estimated 25,000 people turned out last year. What’s remained constant, however, is the bedrock appeal of local music, food served by area restaurants, arts and crafts and family activities all arrayed along one of the most beautiful and historically significant stretches of real estate in the city. The Boogaloo takes over the linear, ad hoc park formed by the lakeside bank of Bayou St. John. This waterway was once a vital shipping channel for the city’s early growth and today it’s an artery for wildlife, cooling breezes and soothing green/blue views delivered right into the heart of New Orleans. 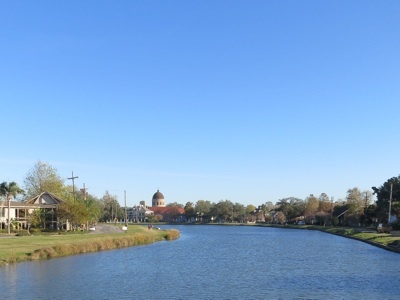 Lined with beautiful homes and anchored by the landmark dome of Holy Rosary church rising in the distance, this Mid-City stretch of Bayou St. John in particular is one of those sites of everyday magnificence. Add a festival and it seems to have a magnetic effect on people. Some set up little camps of blankets and chairs for the day, others wander by for a bite from the food booths and a set of music, while others avail themselves of the waterway, paddling around in all manner of flimsy craft, embarking at the banks to refill their drink provisions as necessary. All of this was hard to picture when the Boogaloo first started. That was in the spring of 2006 when the surrounding Mid-City area was still crawling back to life from the Katrina levee failures. Jazz Fest had just marked its joyous post-Katrina return a few weeks earlier, but it was anyone’s guess how things would go for a new neighborhood festival no one then knew about and one taking place in a neighborhood still in that limbo between outright ruin and budding recovery. But now, with Mid-City booming again, the Boogaloo is a spring calendar fixture that packs a lot of different activities into its three-day schedule. Some of them are a bit offbeat, even by the standards of New Orleans neighborhood festivals. For instance, on Saturday there’s a bicycle pub crawl, which begins at 8 a.m. and makes stops at local bars, a market and the headquarters of the Zulu Social Aid & Pleasure Club before depositing its thoroughly warmed-up riders back at the Boogaloo. And on Sunday, the Metro Bicycle Coalition will hold its own Bicycle Second Line, beginning and ending near the Boogaloo grounds. Once again this year there’s also the Rubber Duck Derby, a race of toy ducks along the bayou to raise money for the Second Harvest Food Bank. The Boogaloo remains a free event, though this year you can also buy tickets for a “VIP experience,” which, at various price levels, gets you drinks, parking passes, access to a shaded viewing area near the main stage and festival merchandise. Of course, following the classic New Orleans festival mold, music is a big part of the affair. More than 40 bands and performers will take the four stages, from gospel and brass bands and a bounce DJ to Russian punk and zydeco. There will be burlesque dance, some stand-up comedy and a dedicated kids stage. The full schedule is here.